Now I know this is not a very Asian dish. Forgive me, please. But I was having my very own personal Iron Chef moment. It was the end of the month, and just about everything was running low. I didn't even have any soy sauce! All I could find in the pantry for protein were some lentils I'd bought last year and never did anything with. And in the freezer there was some asparagus and a bit of feta cheese. I started out making a lentil salad. It didn't thrill me. But I couldn't let it go to waste, either. I have a rule since coming back from Haiti, and I just can't help it. It may not make any difference whatsoever, but food in my kitchen doesn't go to waste if I can help it. No matter what! Putting away the dishes, dusting, finishing the laundry, it seemed as if I were doomed to another lentil salad the next night. Then, as I trudged to the kitchen, a lightning bolt struck. Why couldn't I make hummus out of lentils? It would be uh, green, but did that really matter? Now my neighbor walking by with her dog thought this dish looked ... interesting. And I'll admit I figured this was another one-shot deal. But I was totally wrong. This hummus was really really good! After my last lunch dollop was finally gone, I found myself craving another batch. I changed up the ingredients a bit, and that was even better. This was a keeper. This was lunch worthy. This was party worthy. Heck yeah, it was even blog worthy. This is a great beat-the-heat recipe for summer. One pot and 20 minutes is all the heat you need for a week's worth of light lunches. As an appetizer, it has good presentation, and it's a conversation starter. It's moderate in fat, high in fiber, has many vitamins and minerals — but unlike most dishes you can say that about, this one actually tastes great! Lentils, I have decided, level the hummus playing field. Hummus lovers will try it. I's a new twist on a beloved theme. But hummus haters will give it a whirl, too, because there is no beany taste to contend with here. Lentils are a legume that have an earthy flavor all their own. For this post, I've paired the hummus with a little beef satay, so you're getting a double decker this week. Enjoy! with as much water as directed on the package. Puree this mixture in small batches until it is smooth and creamy and uniformly green. I decided to pair the latest batch of hummus with a little satay to Asian things up a bit, which makes for a really elegant patio style lunch, but I also have a secret reason for it. One all recipe planners need to know. Iron in vegetarian sources like spinach or lentils is non-heme and doesn't really absorb all that well. You'll get maybe 2 to 13 percent of a vegetarian sourced iron. But by pairing your non-heme iron with just a dab of a heme source such as in satay, you substantially increase the iron absorbed. You can find satay recipes all over Asia, and they run the gamut, with all sorts of ingredients and instructions, most of which sound wonderful. But if you want the true masters of the art, go for something Indonesian. Indonesia has so many wonderful versions of satay, you could easily devote an entire cookbook to them. The idea for satay may have originated in the Middle East, but Indonesia took it and made it into an art all their own. Another thing I learned from reading my scattered Asian cookbooks is that satay doesn't refer to peanuts at all. In America, satay usually presents with a peanut sauce and we have all learned to associate the name with that. But the word actually refers to sticking meat with a sharp pointy object. So any marinated meat threaded on a skewer and barbecued to perfection is satay, regardless of peanut sauce. With those things in mind, I decided to keep my hummus satay very simple and just use what I have begun to think lightheartedly of as the Magic Cloak of the Holy Trinity. The Holy Trinity is the ginger, garlic and green onion. The Magic Cloak is the soy sauce and sesame oil. As a marinade, I will tell you this goes with almost any meat and almost any recipe. It blends in without being noticed, yet improves the overall flavor. Now that's some holy kitchen magic if you ask me! Give it a try. You'll be amazed at how simply good this marinade really is. Close up the bag, pressing the air out, and marinate for 15 minutes. Thread the beef on skewers and grill them on the barbecue grill or on the stove in an iron skillet for 1 to 2 minutes each side, until they are as done as you like. Serve each salad with one or two skewers, for a very cool summer dish. And if your neighbor walking by thinks that green hummus is just a little bit odd, well, hey, that's Totally Cool. That way, you don't even have to share! Thanks for visiting My Kitchen and I. For more great beat-the-heat recipe check out these other great #Sundaysupper recipes! I love hummus and trying new versions of it. I can't wait to give this one a try-it looks different then any other recipe I've found but delicious! That color is totally amazing! Thank you so much for participating in this week's #SundaySupper! Love your post! I am with you, I panic when there is no soy sauce too! So honored to have you participating in #SundaySupper. Thank you! I am with you about not wasting food! And look how great this turned out! I have a whole bag of lentils waiting to be used and I think I'll try your hummus recipe. I am such a huge fan of lentils, I'm always looking for new recipes - how imaginative! Great job, Iron Chef!! :D Thank you so much for sharing! Mmm.. yum! It turned out great and perfect way to beat the heat! What an awesome marriage of flavors! What an amazing cool green hummus and that beef satay is sooo delish! Thanks for sharing some of your #SundaySupper with us! Love the ingredients, the idea, the color! Great recipe! Wow I totally love this green hummus. Beautiful color. I am going to have to try this. Very creative. Have a wonderful day. Using lentils sounds like a great idea! Ok I am digging this! I love hummus and make it often, but honestly NEVER thought of using lentils! So creative! What a gorgeous blog! I love hummus and am always looking to try new things. Will be making soon! I've never had humus made with lentils and this looks totally yummy! Love that it has spinach & feta in it also. Satay looks tasty too. This looks quite appetizing. I always have lentils on hand! You are having yourself an Iron Chef moment, aren't you? LOL My favorite way to cook is by scrounging in the pantry! My little guy loves hummus. Spinach - not so much. This is a great way to get some goodness into his little body! Based on your delicious green hummus and beef satay photos, we'd like to invite you to submit your food photos on a Food Photography site so our readers can enjoy your creations. Wow, thank you all for the wonderful comments! I have been on the road a bit and out of pocket but just wanted to thank everyone for visiting and saying such nice things, too. 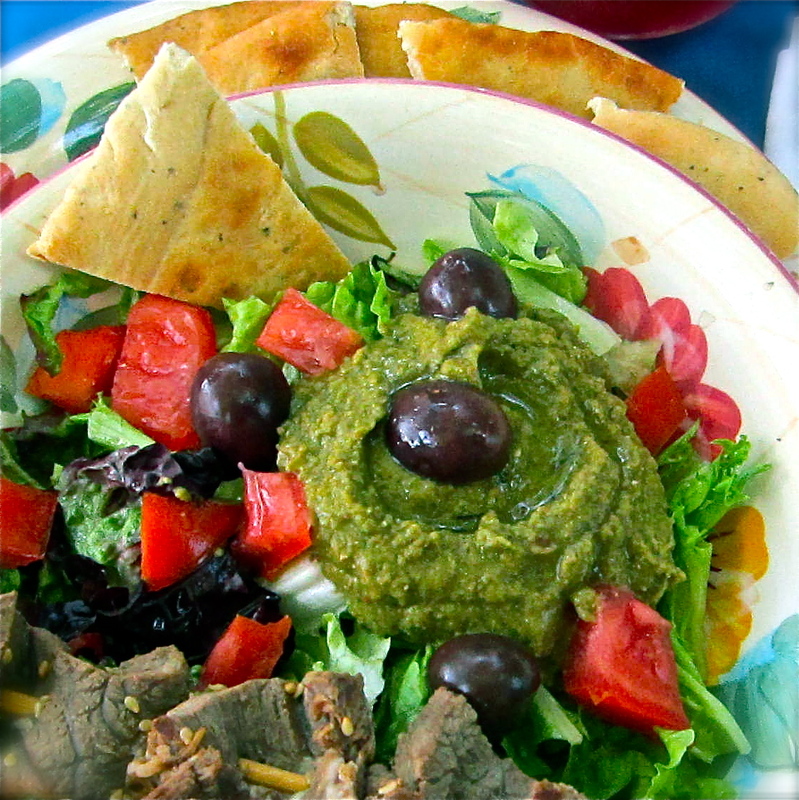 Your green hummus looks and sounds amazing. I have a feeling it's going to be my new obsession. What a cool recipe. I love when things start out one way and end up another. Definitely a creative hummus, but I think I'm liking the satay lesson even more! Keep on cooking by the seat of your pants, it's the best way to go!